Because you demanded it! Since publication of Volume 1 of this series, thousands of teachers are using these innovative classroom tools to improve student learning in science. Following in the footsteps of earlier volumes in the Uncovering Student Ideas in Science series, this all-new book provides short, easy-to-administer probes that determine what misconceptions students bring to the classroom about the nature of science and about physical, life, Earth, and space sciences. This new volume in our bestselling series provides more topic areas for classroom use as well as guidance on how teachers can use the probes for their own learning. As outlined in previous volumes, teachers—like their students—can have misconceptions that come to the fore when administering the probes. 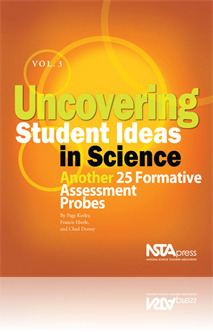 Volume 3 provides 10 detailed suggestions for teachers on how to use the probes to uncover, accurately assess, and correct their own preconceptions as well as their students’ (e.g., do the probes yourself, examine student responses with other teachers, embed the probes into existing professional development programs, select specific areas to focus on, examine student thinking across grade spans, categorize ideas, and crunch data to create classroom profiles). Volume 3 offers five life science probes, seven Earth and space science probes, ten physical science probes, and three nature of science probes. This volume is an invaluable resource for classroom teachers, preservice teachers, professional developers, and college science and preservice faculty. This book is an great book to have in your science library. It is a necessity for any Science Teacher K-12. The probes are assessment tools that every teacher can use to ask questions varying in degree. These probes can provoke lively discussion, encourage argumentation in small groups, and also support students in thinking on their own. All 25 sections in this book are presented in a clear and concise way. It is easy to read and provides teachers with ideas of how to vary their instructional strategies. Thousands of teachers are using these innovative classroom tools to improve student learning in science. This set includes all four published volumes of Uncovering Student Ideas in Science. The item/stock number for this four-volume set is PK193X4.